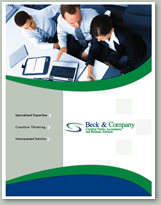 At Beck & Company, Certified Public Accountants and Business Advisors, we are an accounting and consulting firm delivering specialized expertise, creative thinking, and unsurpassed service to ensure that our clients’ financial endeavors flourish. Serving small and mid-sized organizations and individuals in the Maryland area, we provide audit, tax, accounting, and consulting service that address all aspects of your business with one goal in mind – exceeding your expectations. We are able to do this by drawing on our combined business backgrounds and experience in public accounting to help you in virtually any area of your business. Our commitment to excellence is demonstrated in our team’s understanding of your business and personal financial objectives and then delivering innovative solutions to achieve them. Are you looking for a CPA located in Maryland? Allow us to help you achieve your financial goals.